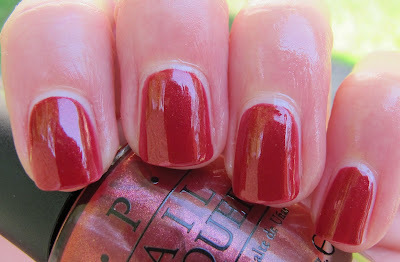 Never Enough Nails: OPI Touring America Fall Collection Part One!! 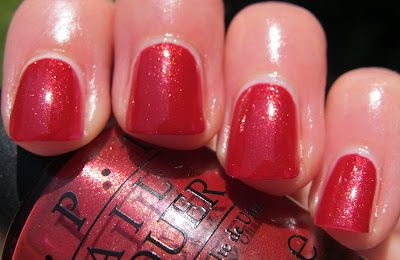 I have been SUPER excited for OPI Touring America ever since we first saw the promo pictures. It just seemed like a collection aimed right at my tastes, lots of vampy colors, a few bright shimmers, some ugly/pretty gray greens and camouflage type colors. Just the very things I love! So, it shouldn't surprise you that I do, in fact, LOVE this collection! The formula on all 6 polishes in this post was lovely. No trouble at all. Get In The Expresso Lane left one single odd patch on my pinky nail, but other than that everything was beautiful. Even the shimmers, Are We There Yet? and Color to Diner For, were lovely to use, even though I read that one blogger had difficulty with them. So, onto the swatches! 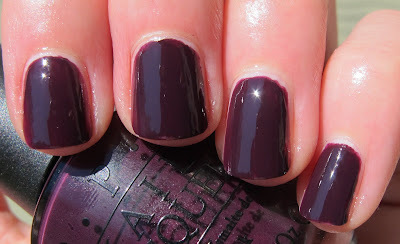 Honk If You Love OPI is a really deep, dark plum creme. This is the darkest purple creme I own ( I have some dark purple shimmers, but no cremes). 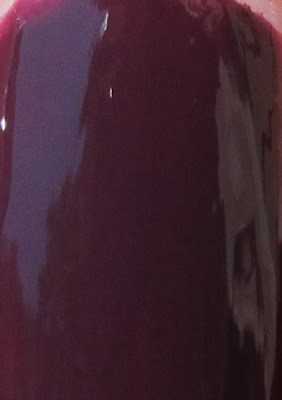 I love this because it is very dark, but doesn't look black, even inside or in the shade. This will definitely become a regular pedicure color for me in the winter. I also can't wait to wear it under the Gold Shatter that OPI is releasing in the holiday collection! This is two coats to a nice opaque finish. 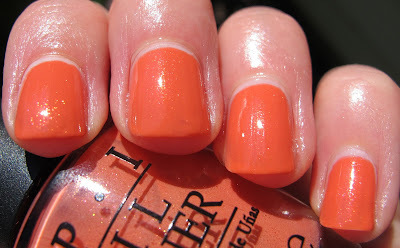 Next I tried one of the shimmers, Are We There Yet?. The name of this cracks me up. Who didn't constantly ask their parents, "are we there yet?" on a long road trip when you were little? I know I did! Are We There Yet? 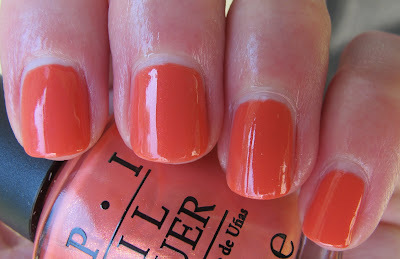 is a pretty coral pink shimmer with a healthy dose of orange. The shimmer in this is kind of hidden when you are inside or in the shade. But it really pops out in full sun. This is three coats for the camera, but two would be perfect for wearing. French Quarter For Your Thoughts is a nice medium gray creme. This is nicely neutral, so if previous gray cremes have been too cool or warm for you, I think this should work. It's not too pale or too dark. It's like the perfect gray creme. 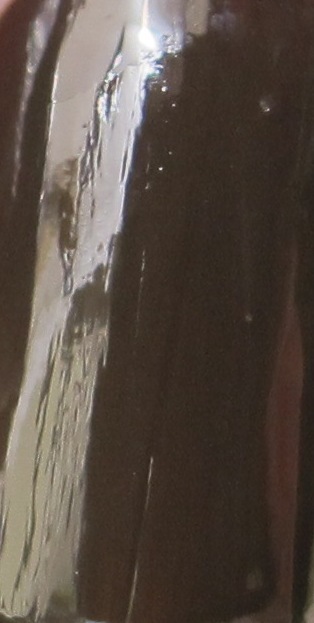 This is just two coats also and I found the formula to be particularly nice on this one. Get In The Expresso Lane is a dark brown coffee bean creme. As a coffee and espresso lover, I love this one. It reminds me of really dark Starbucks Extra Bold coffee. 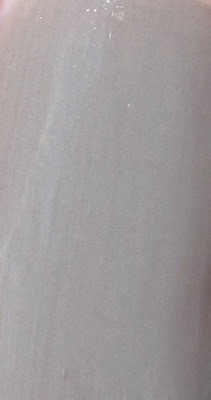 This was two coats, and the formula was great, except for that weird patch on my pinky. That's what happened with another polish the other day though, so maybe my pinky just objects to wearing polish LOL. Or maybe I'm not cleaning the oils off of my pinky as well as other nails. In any case, I love the color of this polish! Color To Diner For was a tricky color to photograph. It's a deep berry red shimmer, but it kept looking like a bright red in my pictures! Please keep in mind that it really is deeper, and more of a berry tone. The shimmer in this is pretty gold shimmer and more visible than the shimmer in Are We There Yet?. 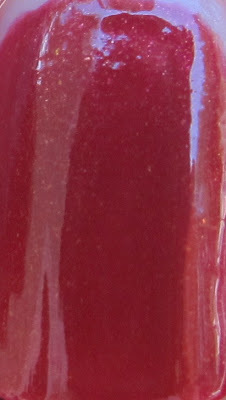 It's still not in your face shimmer though, so if you're looking for an understated berry shimmer, this one's for you! This was just two coats. Nicely pigmented and very smooth to apply. 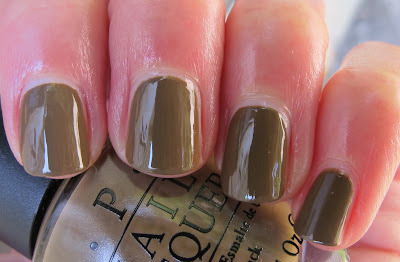 A-Taupe The Space Needle is officially my new favorite taupe polish. It's kind of a dirty, grungy taupe with some green in it. Very cool, and I love the ugly/pretty vibe it has. A-Taupe The Space Needle looked TOTALLY different indoors and out, as you can see from my sun/shade pictures. Indoors, it looks more of a gray-taupe. Outdoors, the brown and green in this polish really become visible. 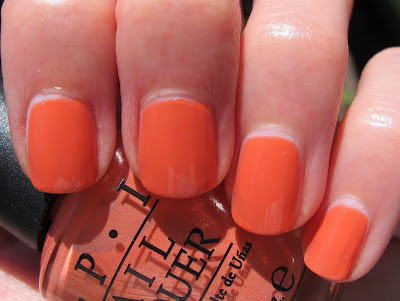 Either way, I love this color and will be wearing it all fall. I also can't think of any dupes in my collection! Overall, this is my favorite fall polish collection! I love all 6 of these colors and their formula. I can't wait to wear them and I also think they'll look great with some Silver or Gold Shatter on top! 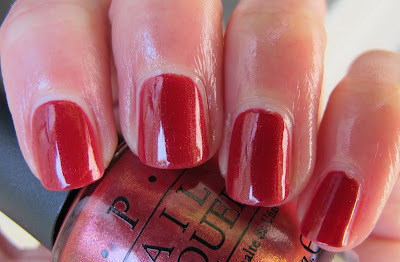 I give the first half of the OPI Touring America collection an A. These should be available starting August 3 at Professional Salons, including Beauty Brands, Beauty First, Chatters, Dillard’s, JCPenney, Pure Beauty, Regis, Trade Secret, and ULTA. 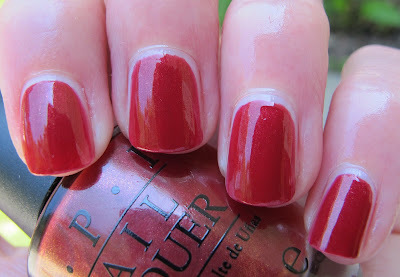 The polishes in this post were sent to me for review by a PR agent for OPI. For more information, please see my Disclosure Policy. I wasn't impressed by the promo pictures but I'm warming up to this collection. I'm the same as Madeline I wasn't impressed by the promo pictures, but I'm warming up to this collection. Madeline- the second half is really nice as well! I think this has something for everyone, even if you don't get a ton of polishes from the collection. Veronica- glad to hear it! Any one in particular catch your eye? HeatherNicole- you'll be really pleased with both of those. They both have buttery formulas and look amazing on! 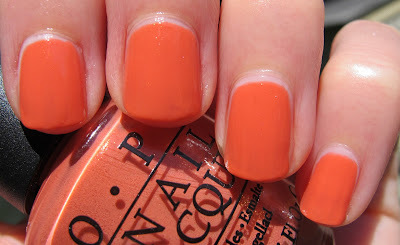 Anutka- Honk If You Love OPI is seriously amazing! I love that it is deep and dark, but never looks black.